Simply put, photographers typically consider only the photographic aspects of the shot. They look at composition, lighting, exposure, and other photographic technicalities. And they wind up with portfolios chock-full of technically perfect and yet utterly boring, irrelevant, and awkward images. In our online workshop we will define the various perspectives of image selection; from photography to styling to makeup to agency and more. Then we will hone our ability to see things from the Editor's perspective. Because while there are many different perspectives with which you can view images, the Editor is bound not by style, photography, makeup, hair, model, or even fashion. No. Instead the Editor is bound by advertising dollars. Why are advertising dollars important? Because advertising dollars quantifies a skill set that is otherwise highly objective. After all, when you have the Guccis, Louis Vuittons, and Pradas each paying hundreds of thousands of dollars to place ads next to the images in your magazine, then you can rest assured that you've selected the right images. Otherwise you fade into the abyss with the rest of the magazines that can't survive in the post-Internet-publication apocalypse. With the Editor's perspective you will select more relevant, more powerful, and overall stronger images. It's this perspective that drives the editorials in my own portfolio. Of course image selection is useless if you can't process the images. In our online workshop we will spend 90 minutes examining my studio B&W post-processing workflow as well as my natural light post-processing workflow. I have an entire library of full-layered Photoshop files allowing us to deconstruct and reconstruct existing images in my portfolio. We will go through each layer and I will explain to you what I did and why I did it. Beyond this explanation I will describe the philosophy behind the overall approach so that you have a good understanding of the high-level direction of each image. This is a workflow-intensive online workshop. We will cover as much as I typically cover in my 2-day workshops. The workshop is designed to improve individual portfolios. With improved portfolios you will attract better models, talents and clients. This is a rebroadcast of the live workshop from December 15, 2012. The payment for the rebroadcast lets you register an account that can access the rebroadcast from lucima.com indefinitely. So you can watch it as often as you want and as many times as you want (as long as you don't share the video). You will also have all the controls that Vimeo provides; play, pause, fast forward, rewind, HD 1080, etc. 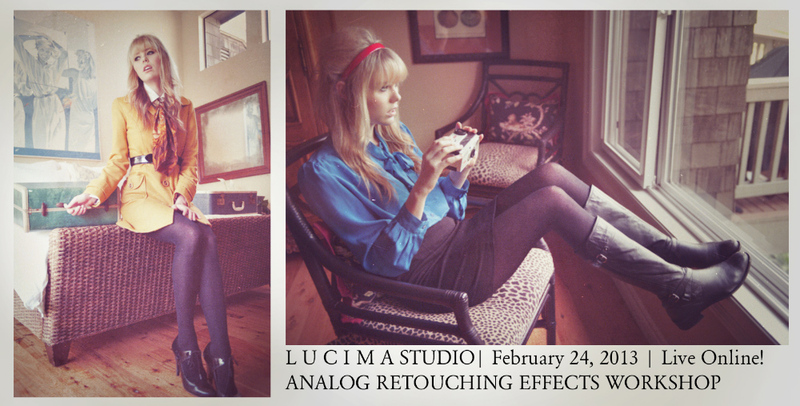 -Check out the rebroadcast of the Analog Retouching Effects Workshop from February 2013!